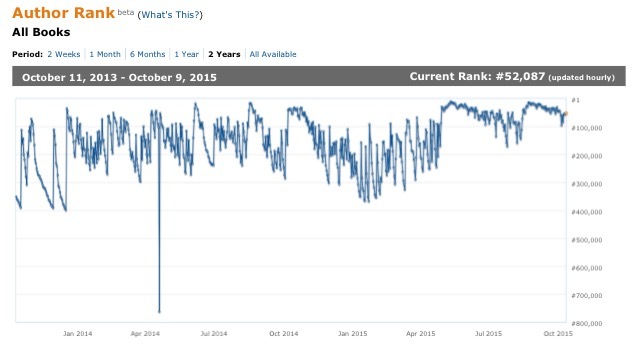 Amazon offers a number of statistics to authors who publish through them- one of them being Author Rank. I don’t know exactly what goes into calculating it, but it’s most likely a combination of the sales rank (number of sales combined with recency of sales) of all an author’s books, plus perhaps something for number of reviews and maybe even score of those reviews. This upward trend is not an inevitable result of having more books. If anything, older books that don’t sell are likely (or so I’ve heard) to act as anchors on an overall author’s rank. My older books hardly sell, but the new ones do, so they’re overcoming that drag. It’s a series of peaks and troughs. Every peak corresponds directly to a time I spent money on promoting a new book. The goal of such promotions is to propel the book into the top 100 of a category bestseller list, where it will become ‘sticky’ thanks to good sales and stay there. If you look at every spike until mid-2015, I never had that stickiness. There was a spike up to 30-50,000 then rapid drop off back to 100-300,000. But, since May when I released my first zombie book The Last, things changed. The book was sticky enough to keep me within the top 100,000 authors for 3 months. Then release and promotion of book 2 The Lost did the same thing. What does this mean? Essentially it means more sales, coming more consistently than before. It’s certainly not big sales- at rank 50,000 there are 50,000 authors selling more than me!- but it’s better than before and very encouraging. What does Amazon use this rank for? It may feed into some kind of predictive algorithm that influences how much visibility a new release gets. If that author has a track record of good sales (high Author Rank), Amazon is more likely to put their new book in front of more people during the release promo window than the book of someone who has never sold a thing. So, higher rank can lead to a virtuous cycle, as long as consistent releases, quality and promotion allow an author to climb up the visibility stack. I expect zombie book 3 will be out in a month or so, so I should be riding that train OK. Stay tuned for more results in another 3 months. Speaking of consistent high quality; I look forward to checking the pre-release version! What I mean to say is that I’m super thrilled that you’re seeing that Amazon is seeing what I’ve been seeing for ages! Your writing is really good and only getting better! I enjoy having the chance to read great books and touching up a few errant apostrophes!